Should we do more ministry online? There’s not much debate that Facebook is THE primary way college students interact with the world. How does that change how and where we (as college ministers) do ministry? I was talking with a friend in the Army and he said that the U.S. Army, notoriously wary of social media, now does over half of it’s recruiting through Facebook. Instead of spending time in malls and with high school guidance counselors, Army Recruitors now spend the bulk of their time online. Many meet their recruits face to face for the first time on signing day. Dave Kinnaman in his talk at Catalyst proposed that the response to the growing isolation among this generation is our presence via technology (twitter, email, facebook, etc). By being present online we can respond quickly to their questions and be more accessible. What do you think? Should campus ministers incorporate online presence into our work schedule? And when (during the day) should that happen? Should we ever spend “hot hours” (afternoon hours) online? Great question/s. I think the question I would want to have answered is: what should we eliminate from our schedules in order to make time for a greater online presence? You’ve already stated that students live online, especially on Facebook, so it only makes sense that we meet them in that place — at least as a portion of our ministry. But in wanting to maintain healthy boundaries and work hours, is there something (potentially outdated, or no longer as effective or seemingly relevant) that could be replaced with more intentional time spent online? If so, what? Guy- Thanks for stopping by and commenting! I subscribe to and enjoy your blog. Great question. I agree – online engagement has to come at the expense of something else. And I guess that’s part of what I’m trying to wrestle through. Because for me, I don’t build it into my schedule or replace anything. And I end up just doing it as I check Twitter at night or at random times throughout the day. But it does creep into “unhealthy boundaries” territory! Hey Tim! Thanks for your response… and those below — lots of good stuff. I find myself wondering about a possible “team approach” to tackling ministry online. I’m currently thinking about creating a blog (that may take on the form of video clips and and snip-its, more so than text) that would be authored by a team of trained students (and maybe a staff or faculty as well). Maybe a team of 3 or 6 or even 10 of us who might only be responsible for posting once every other week or so… but who can collectively utilize our combined social networks to “cast the net” far and wide. Yes, I would hope that all of this effort would one day lead to face-to-face ministry and relationships. But our reality is that we get 4 years (more or less) with students. It would seem that we need to leverage every possible means to get in the path of the students on our campus. What do you think? Do you know of anyone out there using a “team” approach to online ministry? I don’t know of anyone using a team approach. Our team has access to both our Facebook and Twitter account. But only a few use it. But that’s one reason I posted on this – I haven’t heard many talking about their approach to online ministry. So I’m rather ignorant – looking to crowdsource to figure this one out! What purpose would the blog serve that couldn’t be met through, say, a facebook page? The site http://powertochange.com/ has lots of articles and videos that are relevant to students, as well as http://everystudent.com. The content isn’t as local, but is relevant to students. You might consider having students or staff members contribute as part of those ecosystems. I wonder if this means that we need to invest in more compelling Gospel presentations online (videos/ graphics, etc) – more eye-appealing things that will have students wanting to click. How easy is it to measure the effectiveness of that? Also, although students “live online” that is a bit of a relative statement. Students read, chat, and socialize online, but a good portion of that starts (IMO) with face-to-face interactions in some degree. So if we invest more time online, what would we do online? Should that be your whole team, or just a few people designated to take 2-3 days a month to dedicate to this? Thanks for stirring up the discussion! Great insight Brett – I agree that it almost all starts face-to-face. And I think online engagement will never come anywhere close to the effectiveness of face-to-face old fashioned discipleship and evangelism and small groups. I see it more as a supplemental thing. A way to quickly respond to students and be more accessible to students. For me, it’s a way to have touch points with FAR more students than I am able to face-to-face (especially freshmen that I barely know). On your video thots – Brian Barela, on his blog, has had some good posts on that in the past. He argues that video and pictures are THE way to engage on Facebook. I am SO curious to read the dialogue that will go on with this post. Great questions, Tim. I have been thinking about this for the last 3 years and yet don’t know how to go about doing this—-or maybe somewhere deep down I can’t justify it. That is probably showing my age. 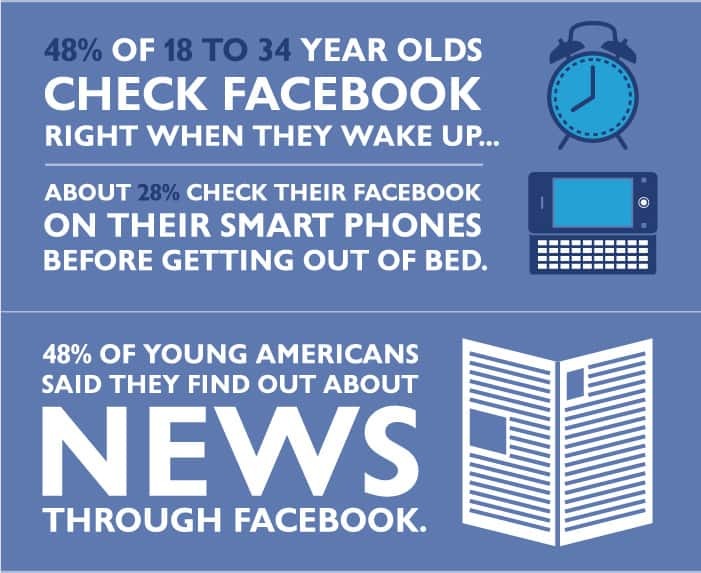 Your stats about how much time they are on facebook make it seem like a no brainer….but then, what do we not do/take out of our schedule? I like Brett’s thoughts on creating compelling Gospel presentations to post online—-with so much being viral and people being willing to watch something because no one would know they are watching it makes me wonder if some of this can sow seeds in a way that would be very effective. I’m in the same boat as you Ali – and I think it’s less age and more maturity 🙂 Or at least we like to think that. I think we should be wary and make sure it’s worth replacing something in our schedule. But it’s definitely worth wrestling with because it is such a huge part of their/our world. As I read the post and the responses, a battle began within me. I agree that we should be leveraging technology and specifically facebook and Twitter to get the Gospel to everyone. On the other hand, I see how students are becoming more disconnected and alone even though they have thousands of “friends” and “followers.” There is a false sense of having deep friendships. By using tech more, are we feeding that? Are we saying that it’s okay to isolate yourself because you can find whatever you want online? Even religion. It seems to me that a face to face interaction would be the best kind of ministry. So, given a limited number of hours, I’m going to fill as many of those hours as I can with face to face ministry. Judging by my experiences in the past, I am not going to be able to fill up all of those hours for various reasons (before lunch is usually no good, students in class, etc…). In those hours, perhaps I could be figuring out better ways to be an online ministry presence. I would not use hot hours (by definition the hours when students are most likely to meet face to face) for online ministry unless something doesn’t go as planned and I can’t fill those hours. The best way to take advantage of that infographic, in my opinion, is to be savvy about using social media to move toward or reinforce face to face ministry. For example, I facebooked two guys once who I couldn’t get in touch with for follow-up about a bible study, and they messaged me back and showed up at the next one after I gave directions.